June 24th – Mont-Tremblant 70.3 IronMan finisher! July 14th – Ran 33:24 to improve her Boot Scootin’ Boogie 5k time by 3 minutes! Wow! With such an amazing year, Tammi has vowed to finish strong. 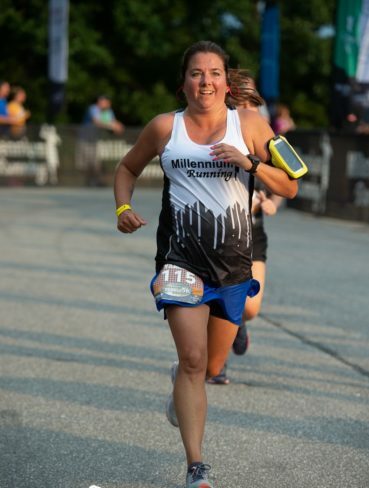 You can catch her chasing personal bests at any one of Millennium Running’s fall races. Be sure to cheer her on and grab a high five from Millennium’s newest Athlete of the Month. Congratulations on this honor Tammi, no one deserves it more than you! Cheers to future personal records! Every month, we recognize and celebrate the achievements of a member of the community. An athlete, as nominated by their peers, will be chosen to be honored as the Athlete of the Month. We are not just looking at those who consistently finish at the front of the pack, but also those who demonstrate exemplary character and are a positive influence on their community. These qualities include, but are not limited to, dedication, commitment, leadership, and perseverance. If you know of someone who you would like to nominate as Athlete of the Month, please fill out the form.